Ask any Vietnamese person, regardless of their position in the family, and they will tell you one thing. Food is very important. It’s not only important culturally to the country of Vietnam, but it’s also an integral and very important part of the family. Food brings people together. At The Anam, a five-star luxury hotel on the Cam Ranh Peninsula in Vietnam, the importance of food is front and centre. Boasting three main restaurants and several bars, there’s absolutely no chance that guests would go hungry. The Anam is located about 30 minutes from the busy centre of Nha Trang. It allows easy access for its guests to Nha Trang, via a shuttle. Guests are free to spend their days, and nights in town if they wish. However, many guests also choose to stay in-situ, taking advantage of everything the resort has to offer. As such, The Anam must offer a range of food that appeals to everyone from children to couples wanting a more intimate dining experience. They must also cater for the myriad of dietary restrictions that people face today. Similarly, they must be able to provide an interesting and dynamic menu to all, making sure that food boredom is not something a guest will suffer from if they are staying for the average six to eight days. 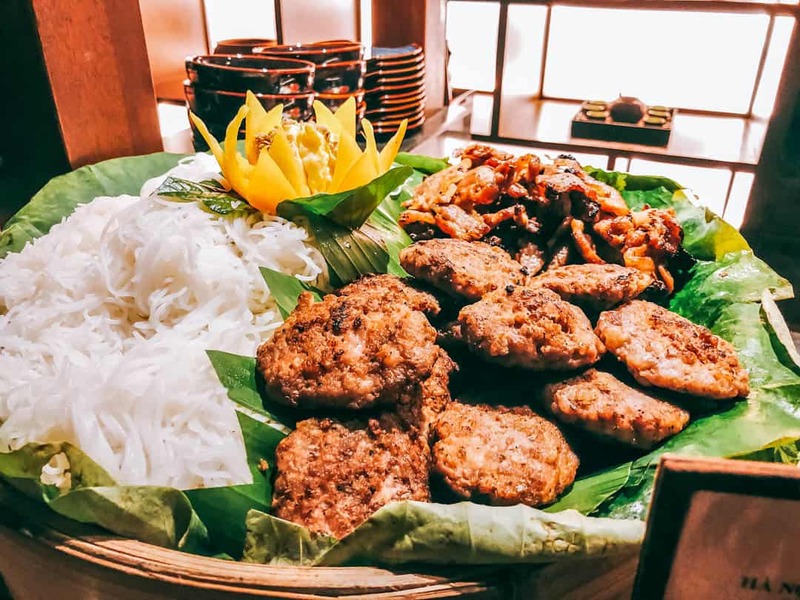 Given this is a Vietnamese resort, they must also provide standout Vietnamese cuisine, ensuring that guests still get to be part of an authentic experience, even if they only ever traverse the path from their villas to the restaurants and back. Finally, they must take into account that not everyone who travels and stays here is a food adventurer, therefore making sure there are more common foods that travellers can align to. The Anam gets the whole culinary experience right, with all of the above possible throughout the dining establishments of the resort. I stayed here for three nights, and as you will see from my food flight below, I was left in no doubt about the culinary skills of the chefs. The food is amazing and so is The Anam luxury beach resort. There’s an obvious synergy here between a philosophy of serving a variety of fresh and interesting cuisine and the selection of several up and coming chefs at The Anam. Chefs with a passion for food and a way of using it to delight and surprise their guests. Ye Chang Sheng heads up the team as Executive Chef. A Chinese national, I immediately detected what I thought was a South African accent when Peter, as he likes to be called, visited our table. It was indeed, as Peter headed to South Africa after finishing his studies, honing his craft at many of the leading luxury hotels in the country. Following the South African trend, Executive Sous Chef Wayne Cameron also learned his craft here, before working for luxury hotels both at home and in the Seychelles. Wayne and I had a bit of light-hearted banter about the rugby and cricket of our respective countries before settling down to discuss the food. Over at The Colonial, young chef Nguyen Duy Anh picked up his love for cooking from his mother. “When I was a child, I really loved watching my mother cooking foods, and then I tried practising cooking the same dishes for my family”, he said, His passion developed further when nine years ago, his sister bought him a cooking course and the teacher encouraged him to pursue a food career. A man following my own change of career as an accountant, he too was an accounting student, who one day realised he loved food more than numbers. “My feeling to be in the kitchen is like stepping into a second house which is so nice, warm and comfortable”, he said, “It is so amazing when the diners really enjoy and love your food”. 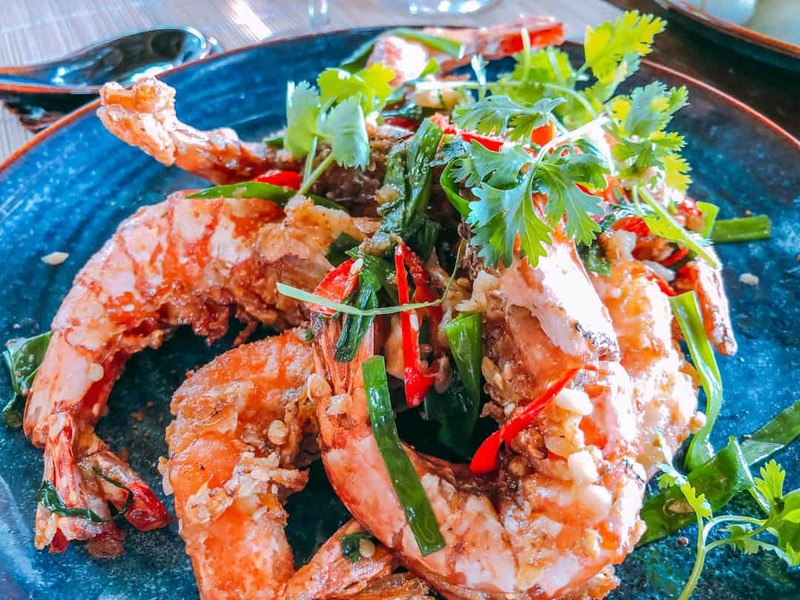 Lang Viet is the home of traditional Vietnamese cooking at The Anam, In a restaurant with high, vaulted timber ceilings and open sides welcoming the sea breeze in, it’s the perfect spot for lunch or dinner. If you are dining here for lunch, I’d suggest bringing your swimwear, then you can simply migrate effortlessly from the restaurant to the Beach club, to the ocean and make your way back here again for dinner. That would be a perfect day! I dined here with friends as we were treated to a sumptuous lunch, with some of the star dishes on the menu. Spring rolls are always a favourite and when they are this good, it’s hard to stop at one. These tasty morsels came with minced pork and crab within the crispy pastry walls. Of course, there is always a tasty sauce or two accompanying food like this, and the odd chilli as well. The morning glory salad proved to be one of the best. Morning glory is a flower that blooms in the early morning in Vietnam. It is also a mainstay as an inclusion in most meals in Vietnamese households every day. The stalks, which are hollow and crunchy and the leaves are steamed, similar to how you would cook spinach. Eaten on their own or mixed through with other foods, this dish had beef, chilli, nuts and herbs like mint and coriander mixed throughout. The Vietnamese also love seafood and prawns feature regularly, either on their own or minced in things such as spring rolls. A little garlic and chilli were all that was added to these tiger prawns to deliver a kick of flavour. 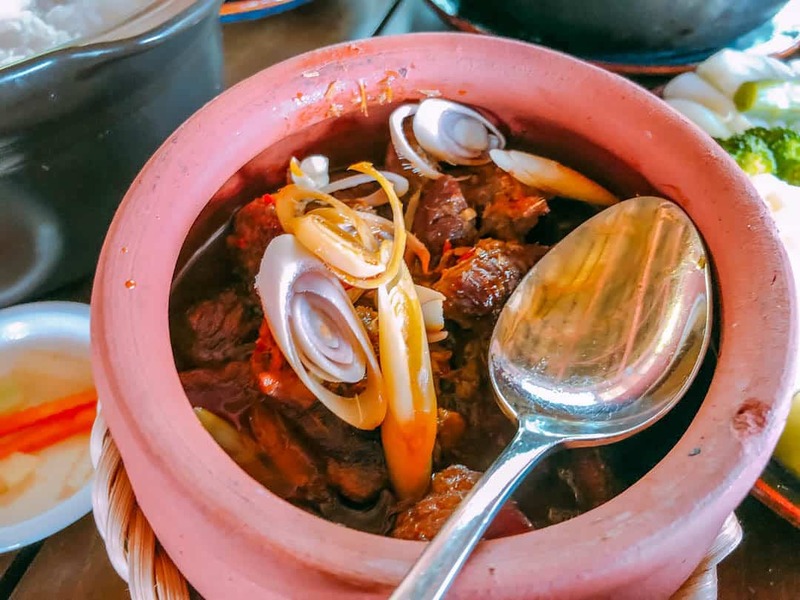 Clay pots are used extensively throughout Vietnamese households as they provide both a good vessel for cooking in, retaining all the flavours and keeping the protein moist, and can be served straight to the table. We enjoyed chicken from this clay pot, steamed with rock salt and with the addition of lemongrass. Anything braised is always going to be something I love and the slow-cooked beef shanks with lemongrass and chilli got my tick of approval. Vegetables are also served with every meal, but not in the way in which many people from western cultures would be used to. Instead of serving the vegetables alongside the main meal, here the vegetables are served as a separate course. This is because a traditional Vietnamese meal is always conducted in a series of courses, not with everything put on one plate. The vegetables here are fresh and steamed so that they are still crunchy and still actually look like a vegetable. The fish broth didn’t look especially appetising, but the clear liquid, with mustard greens floating throughout, was delicious. 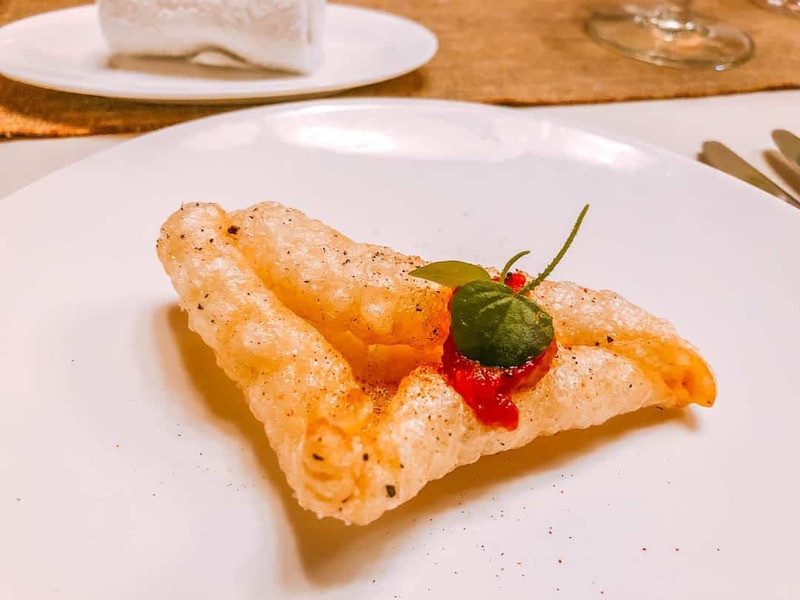 If The Colonial served up my favourite fine dining experience then the Lang Viet was responsible for my favourite food experience, and, whilst the food was amazing, it was the concept of Mama’s Cooking that had me hooked completely. The concept, where the Mama’s or aunts of the chefs at The Anam, come into the restaurant two days a week, was borne out of sheer need and possibly a hint of desperation. Having opened in April 2017, demand for The Anam escalated quickly and it became obvious to General Manager Herbert Laubichler-Pichler that they needed more chefs. As the management team strategised over the ways in which they could fix the problem, Herbert had an epiphany. Knowing how important food and the art of cooking was to every Vietnamese household, and how the learnings were often handed down to children, he floated the idea of using the staff’s mothers. What started as a stop-gap operation, has now become a star attraction at the resort. Every Wednesday and Saturday, the Mama’s take up their positions in their specially built huts containing their kitchens. Under the gaze of interested guests, they cook their traditional fare, using the recipes, ingredients and special touches that they have carried down from their relatives before them. According to Herbert, it’s like “coming home to your own Mama”. This is real food, cooked with love and without any changes to suit a western palate. If they make the dish with heaps of chilli at home, this is how it is served here. It’s a wonderful atmosphere in here as well as guests roam from each hut, watching the Mama’s cook and trying to decide what you would like to put on your plate. My suggestion is to take small amounts of everything if you can and just keep going back until you have tried everything from every Mama. As the club lounge during the day for VIP guests and those staying in the high-end villas, the main game here is breakfast. Here you can enjoy a quiet start to the day in the much smaller dining area. The majority of the guests take their breakfast in The Indochine. The breakfast buffet is smaller but that doesn’t negate the quality or the range. In addition, guests are also able to enjoy dishes from the a la carte menu, cooked to order. Despite the buffet looking pretty good with its range of pastries, bread, fresh fruit, cheese and cold cuts and some beautiful Iberico ham, the a la carte menu was always going to get my attention. First up, a Vietnamese pho. I love pho and will always eat as much as I can when I’m in Vietnam. It might seem strange to some to have it for breakfast, but it sits perfectly with me. If you aren’t feeling up to this early in the morning, the menu covers all the usual suspects of egg-related dishes, but many with a twist. My eggs benedict had a fresh tomato salsa on the side. Dinner at The Colonial is when the show really starts with the chef raising the stakes to deliver modern French cuisine. With a nod to their French history, this is a fine dining experience for guests who like something out of the ordinary, and for most, something they wouldn’t do at home. The amuse bouche kicked off in style with puffed pork crackling. Light and airy in your mouth, it was unmistakenly pork decadence. The next course scored top marks from me for its presentation. The parsley sponge had been made using an ISO gun, providing soft, melt-in-your-mouth pops of softness. Pickled beetroot, cooked sous vide, and beetroot gel were the stars, offering both a strong flavour and standout colouring on the plate. 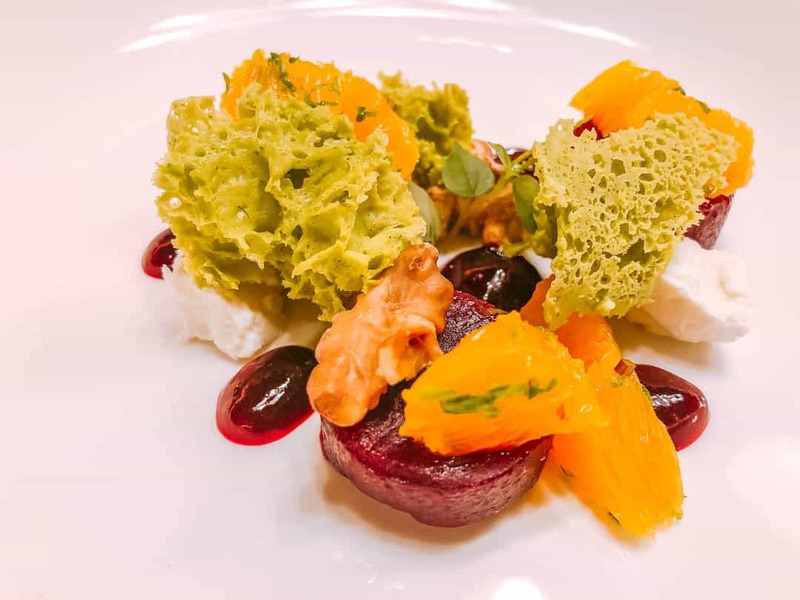 Mint and orange go perfectly together and paired with beetroot, it’s a winning combination. A few blobs of goat’s cheese and another perfect pairing of walnut made this dish a winner. A fillet of Patagonian toothfish arrived next. Cooked so it was still just translucent inside, it came with buttered chanterelle mushrooms, charred baby leeks and celeriac puree. A few pearls of wild salmon roe sat atop the fish and a prosecco beurre blanc sauce tied it all together. The main meal won me over because it was wagyu and I just love wagyu. Instead of just being presented with a piece of fine beef on our plate, our wagyu became the centrepiece for a wagyu wellington, separated by a mushroom, onion and herb duxelles and encased in a light, flaky pastry. With buttered garbanzo beans on the side sous vide baby carrots, and a black garlic jus, it was rich and deeply comforting. The final addition of a braised beef short rib croquette was really the icing on well….the wagyu wellington. Dessert, with a Grand Marnier sabayon, fresh berries and a hazelnut biscotti, was the perfect end to a wonderful selection of food. The buffet at The Indochine could keep you eating there for hours, such is the range of both hot and cold dishes. Freshly made breads and pastries tempt even those not used to eating them in the morning. If you still prefer that dose of protein to kick-start your day, try out the many offerings at the live cooking station. Omelettes or your eggs cooked any way are popular. With the weather outdoing itself whilst we were here, we chose to dine outside at The Indochine. Here the offering is mainly from the buffet, however you can choose a la carte at lunch. Juicy chicken pressed around a stick and smothered in rich satay sauce. I think you will start to see now that eating at The Anam is as luxurious as its surroundings. A curried vegetable pickle, and a sweet and sour sauce added further flavour. The beef here is good, so good I had it again at The Indochine. This time, it was marinated in teriyaki, sitting atop a pumpkin and paprika puree and with a quenelle of sweet potato mash and black olive and sun-dried tomato chimichurri. If I’m ever going to opt out of something in Vietnam, or anywhere in Asia, it will be the desserts. The Vietnamese love sugar and their desserts are usually too sweet or are just flavours I’m not a fan of. The selection below, mango and pistachio rice cake, and lotus and watermelon fruit salad were certainly enjoyed by others around me. If you want an amazing Vietnam beach holiday, The Anam is a perfect choice. Not only does it have awesome food, but there are so many activities to get involved in. Or, you can simply spend time relaxing in plenty of great locations all over the resort. Want to see more reviews? Head on over to Trip Advisor. The Anam is one of the closest beach resorts near Ho Chi Minh City, with flights only taking approximately one hour. Nearby Cam Ranh International Airport accepts flights from many Asian locations, and Hanoi, the country’s capital is only 1.5 hours north via air. A hotel shuttle is available upon request to transport guests from the airport to the resort. We flew AirAsia. Read my review on one of Asia’s best low-cost airlines.